» Reviewed by William F. Deeck: RUFUS KING – Museum Piece No. 13. Reviewed by William F. Deeck: RUFUS KING – Museum Piece No. 13. RUFUS KING – Museum Piece No. 13. Doubleday Crime Club, hardcover, 1946. Reprint paperback: Bantam , 1847, as Secret Beyond the Door. 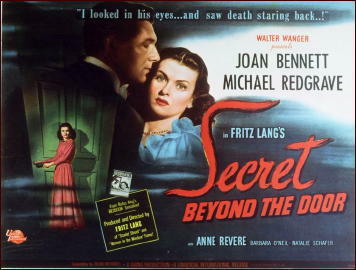 Film: Universal International, 1948, as Secret Beyond the Door (with Joan Bennett & Michael Redgrave; director: Fritz Lang). Bantam Books describes this novel accurately as “suspense.” A wealthy widow is cajoled into a frenzy or falls in love at first sight, or something like that, with a publishing tycoon, himself a widower. She apparently feels that he will be like her first husband, a dedicated coupon clipper who devoted himself to her. Her bankers, who cannot turn over her money to her unless she marries a suitable man — for which read “rich” — hurriedly give their imprimatur, though the tycoon would have been found to be in dire need of a fresh infusion of cash to keep his newspaper going if they had investigated a bit more thoroughly. She, with substantial wealth, would appear to have no lawyers to advise her. The tycoon collects rooms in which murders have taken place, buying them and moving them to his mansion intact, apparently even to the dust that was present at the time he bought them. Although the tycoon delights in giving tours of his collection, he does not allow a thirteenth room, recently finished, to be viewed by anyone. It is obvious that the man is interested only in his new wife’s money, and even she dimly begins to recognize this when she moves into his home with his strange sister, brother-in-law, secretary who wears a veil to cover a scar that doesn’t exist, neurotic son, and a an egocentric star reporter. Acting on advice of a psychiatrist who is making judgments on the woman’s quite limited and mostly wrong knowledge of the tycoon and on almost no knowledge of the woman, the tycoon’s new wife checks out room No. 13. Although her husband, when he’s around at all, and the household are often out during the day, she needs must select 4 a.m. for her trip to the mysterious room. There are those who will master that at first reading. I am not one of them. But if you like that sort of thing, and I admittedly do, there’s a fair amount of it here. — From The MYSTERY FANcier, Vol. 9, No. 5, Sept-Oct 1987. While it’s not his best film the Lang movie is good and fairly close to the book with Bennett always good in these. This isn’t my favorite King — I like the Stuff Driscoll and Valcour books better — but he’s is generally entertaining, though as stated above the prose can get a little convoluted at times. Admittedly this is one of those where a little common sense would negate a lot of the suspense, but then to be fair people behave this stupidly and worse in real life all the time. And to be fair it wouldn’t be much of a book if she didn’t look to see what’s in Room #13. Didn’t this one appear in a shorter form in one of the slicks? I think that has to be the hardest job for a writer of suspense fiction — having your characters make smart choices and still getting into scrapes and other trouble they can’t get out of. It could be that the slicks haven’t been indexed fully enough yet, but King doesn’t seem to have been involved with them after 1940 or so. A biography of Fritz Lang says that one of Lang’s assistants read this book serialized in a magazine, showed it to Lang – and that he bought the film rights before the novel appeared in book form. Thanks, Mike. Anyone reading this far into the comments ought to stop now and go read your essay — very well done! I’ve also continued to investigate the appearance of Rufus King’s novel in magazine format, and David and Mike, you’re both right. 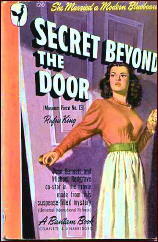 From the Gutenberg page of copyright renewals, I found “The secret beyond the door” published in Redbook, December 1945. Apparently (but not conclusively) a one-shot appearance, and if so, almost assuredly in abridged or condensed form. Other than bestsellers Hollywood didn’t seem to read a lot of novels, but judging from screen credits they read the slicks faithfully. 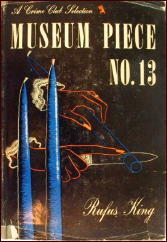 Many of the novels that were filmed were bought on the basis of a magazine appearance or serialization, and both Dashiell Hammett and Leslie Charteris wrote “pictorial” stories for the slicks to promote their work (a Nick Charles story by DH and LC appearing as the Saint in another pictorial story). And I can’t help but comment that the quality of the stories filmed began to fall off about the time most of the slicks quit carrying fiction or abridging novels. Of course the magazines still provided fodder well into the sixties with Duel, Rollerball, and even Topaz all making magazine appearances first, though in Topaz case I doubt that was how it came to Hitchcock’s attention. But I think today when we question why such and such a book wasn’t considered for a movie we may be ignoring the fact that too many Hollywood types just don’t read books.